I have written and rewritten the opening line to this post three or four times because whatever I say sounds too dramatic. I’m promising you things like life fulfillment, spiritual experiences and dying happy. This (as any) recipe will not fix your debts, your job, your marriage or your hair. But it might fill a little hole in your life you didn’t even know existed. You might know about it if you’ve ever been to Italy, where you may have eaten a piece of oily, salt, doughy, chewy bread (schiacciata in Florence, pizza bianca in Rome, focaccia in Genoa, etc. etc.) that pretty much knocked you over. If you haven’t been, there’s no need. Now that you can make it at home, save the money on a plane ticket and splurge on some wine. It goes really well with this stuff. I’d eaten way more than my fair share of schiacciata all’olio from a bakery called Pugi in Florence’s Piazza San Marco, which I passed through every day on my walk home. I’d buy the stuff by the meter, practically, and eat most of it before making it to my neighborhood. They’d make a batch around midday and another after 5 pm. When I introduced Francesco to the stuff many years later, he actually stole it out of my bag to get another piece. I guess he knew I wouldn’t share. 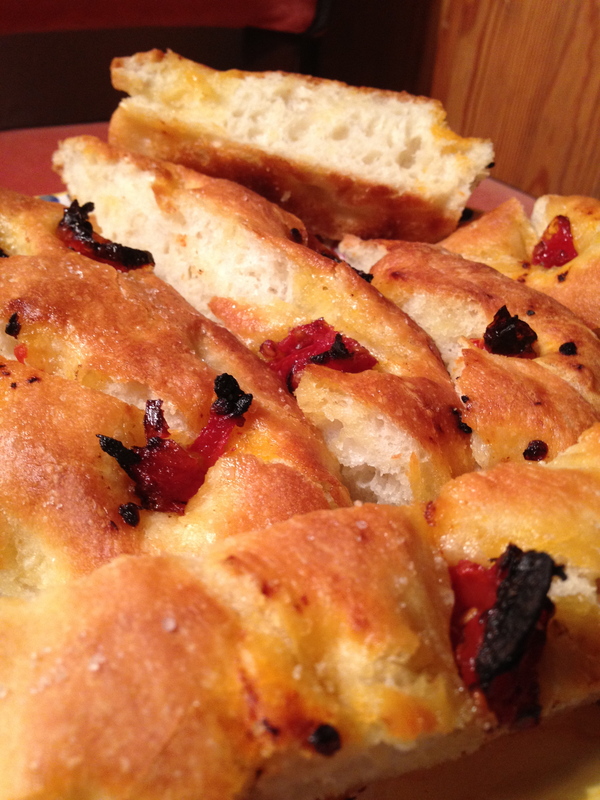 Unwilling to live without it – and often wanting bread for the evening but with no time to make no-knead bread – I eventually started tinkering around with making focaccia at home. I didn’t even glance at a recipe, which is probably why, for the first long while, it turned out pretty blah. It’s also probably why it eventually turned out so well. Recipes, I think, have the tendency to make people nervous and overly exact. They keep turning to the recipe rather than thinking about what they’re making. And that often turns out less than stellar results. I realize the irony in someone who supplies people with recipes saying recipes are bunk. So let me clarify: in most cases, recipes aren’t useless, but should be used as a jumping off point rather than the Holy Grail. Sometimes, recipes should be followed pretty closely. I’m sure if I ever made something that required lots of time, effort and skill, I’d follow a recipe, too. But that’s not the kind of cooking I do and it ‘s not the kind of cooking I share. So! That being said, take this recipe that I’m approximating below, read it over once and then go for it. 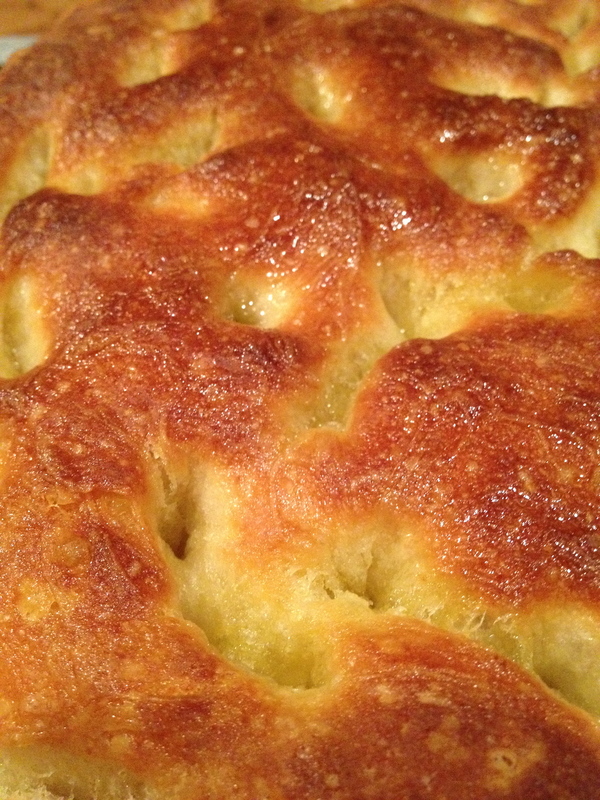 It accurately represents how I make what I consider to be the world’s best homemade focaccia. (But if you want to prove me wrong, you are more than welcome – nay, encouraged – to bring me some of yours.) I never measure the ingredients, so don’t follow mine to the letter. Think of it as a sounding board, a starting line; I hope it ends up making you as happy as it makes me. This makes enough for 6 large sandwiches or to supply 6 hungry people with bread and/or appetizers at dinner. If you want to add toppings, push them in when you poke the holes in the dough. I often top it with semi-dried tomatoes, olives, rosemary, halved cherry tomatoes or herbes de Provence. I’ve also used caramelized onions, gorgonzola and that kind of stuff, but with less success. I’ve considered thinly sliced potato with rosemary… but the simpler the better here, I think. Just don’t forget to use LOTS OF OIL and LOTS OF SALT. Buon appetito! Mix the flour, yeast and big pinch of salt in a large bowl. Start adding the warm water and stirring with a wooden spoon; add enough warm water so that the mixture starts to form a ball…it should be something you can knead, adding more flour if necessary to keep it from sticking. Now, flour a work surface and have more flour on hand. Dump the dough out – don’t wash out the bowl – and knead it with the heel of your hand for 1 full minute. We don’t want fingery kneading: knead it like you mean it. Get your shoulders into it. The more kneading the better, turning it over and over itself, but 1 minute is enough. Before you take it off the tray, guess what you do? Yep, sprinkle even more delicious olive oil on top. Don’t question it. 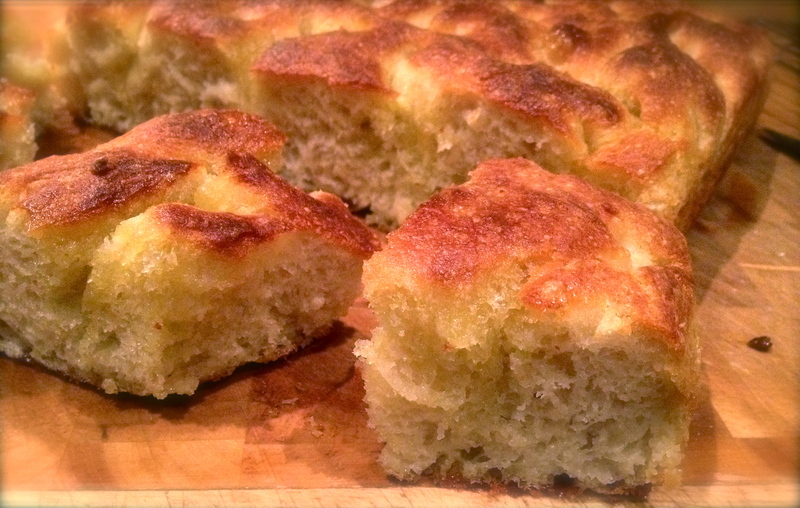 Don’t let your brain stand in the way of your desire for the best focaccia ever. After about five minutes, take the focaccia out or de-tray it, and slice using a serrated knife (otherwise it may crush a little). Enjoy warm plain or with anything stuffed in the middle (prosciutto or brie are personal favorites). It’s perfect for sandwiches, and can be frozen while still fresh (as long as it’s not still warm). it’s here, it’s here! i can’t wait to make this as a well-earned distraction from thesis writing. and i would never doubt adding lots and lots of olive oil, again and again. olive oil is afterall how magic happens. That sounds and looks sooooo delicious! Can’t wait to try it. It is! With lots and lots – but not 2 cups – of salt! I can’t wait to try this one out!